In the office where my mom used to work, there was a sign posted next to the large office calendar that read, “Dates in the calendar may be closer than they appear.” Most members of group 81 are fully aware of how many days they have left in Samoa off the top of their heads. I had a media-related issue last night that I called Koa about, and his solution was, “We’ll be back in America in 53 days...” Koa’s leaving a week after me, so my countdown is even farther along. But I find the countdown only creates stress, so I try and avoid thinking about it. On the other hand, I am acutely aware of how many weekends I have left (seven including this one), and since weekends are the only time of week when I can really do much in-country travel, I’m trying to mete out weekend time a little more wisely. Since everything shuts down Sundays, I mostly treat weekends as a Friday-Saturday affair. First the constraints. 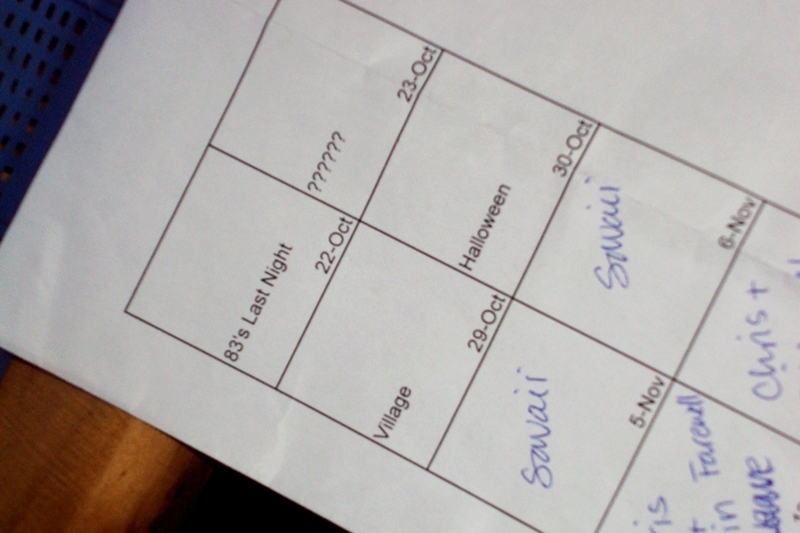 We’ll be celebrating Halloween next Saturday and Thanksgiving on my penultimate Saturday in Samoa. This leaves 5 remaining Saturdays (including tomorrow) before I leave. Money is also more of a factor than I’d thought it would be. Whereas prior to May of this year, I was putting a little away every month, I’ve since been squandering my cash on who-knows-what. I don’t think this should be too much of a factor, but it’s still good to keep in mind when considering the next part of the finite weekend equation: the list of things I want to do. Visit Savai’i at least 1 more time. This list actually seems a little modest. It seems like there should be more, although nothing else comes to mind at this point. One thing that can be safely said is that if I’m going to do all of these things—or even most of these things—my weekend schedule is going to be crowded for the rest of my stay in Samoa. There’s the consolatory idea that I whatever I don’t do in the next 6 weeks can be done on some subsequent return to Samoa. And while I’m not at all opposed to coming back to visit, even returning for 2 weeks doesn’t seem like enough time to accomplish much at all. RPCV Max has been visiting these past 2 weeks, but he’s spent most of the time catching up with his host family and living the typical PCV lifestyle; that is, saving all the fun stuff until it’s too late. I hope you’re well. Happy Birthday Dustin! Picture below. Girls after year 13 camp last night. 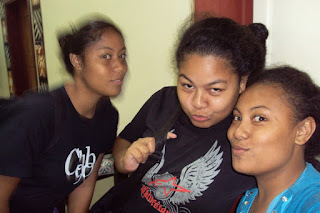 Left to right: Amanda's sister (sorry, I don't know her name), Tafale, Amanda.